There are days that I really miss college. As a Mass Comm major and English minor, I wrote a myriad of papers disecting cultural trends and society and society's connection to cultural trends and all that bullshittery. [Tangent: Things I wrote 10+ page page papers on in college: Why South Park's Jimmy and Timmy are Advocates for the Disabled; Amelie and Clueless: Modern Day Matchmaking In Film; and Geek Chic: How Nerd is the new Black.] 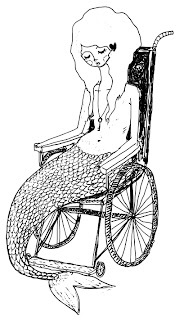 Even in my studious of days, I could not have projected an apparent trend on the horizon... something I never thought would catch on...mermaids in wheelchairs. Yes, you heard correctly- they are all the rage, it seems. Yesterday I was perusing this article about a feud rocking the music world: [Tangent: You will see this is the worst feud ever...in existence.] 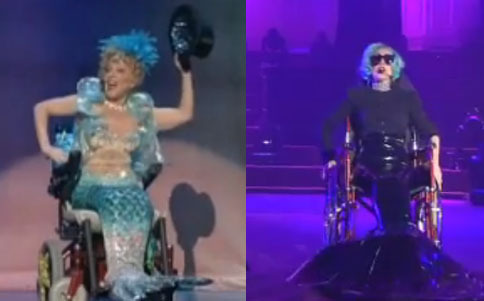 who originated the Mermaid in a wheelchair schtick: Lady Gaga or Bette Midler? 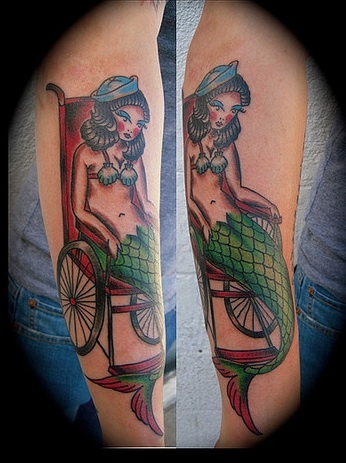 tough call...jazzy wheelchair mermaid vs. creepy wheelchair mermaid. I kinda feel like I need this, but why does she look so somber? Again why does she have to be so debbie downer about it? Maybe it's because she has no hands and is doubly disabled. I guess I first saw the correlation at MDA summer camp many years ago. 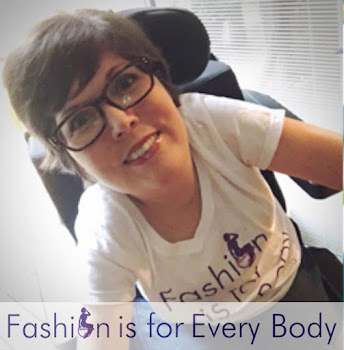 After seeing a little girl with Muscular Dystrophy sing it on Karaoke night, I remember looking at a friend and just mouthing, "god, this is heartbreaking." Watch the below clip...about midway through close your eyes and replace Ariel with an adorable little wheelchair chick. Cue the soul wrenching. Crazy right?!? It has even been suggested that if I do a one woman show, I somehow integrate this song into my act to make my audience feel sufficiently awkward. 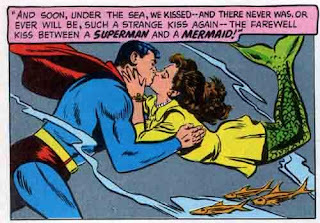 Now that I've shared this weird insight, I hope I have forever ruined mermaid culture for you, and turned a lovely movie about a talking crab into an allegory about disability. 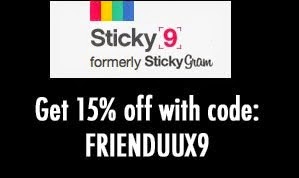 You're welcome!!! 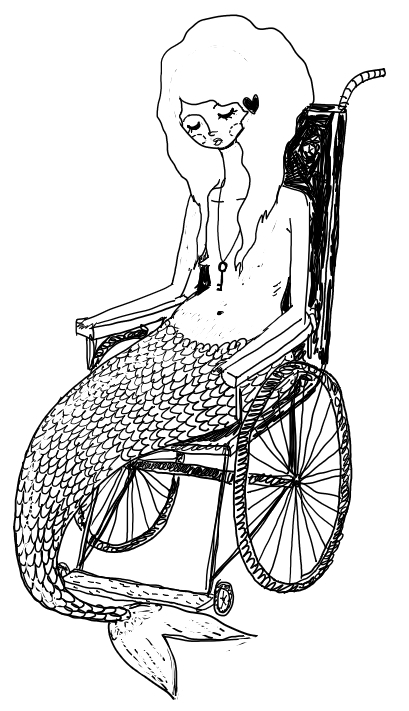 Nah, mermaids are still hot. 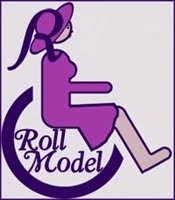 all i have to say is, if i had Gaga's financial resources, I would definitely be getting a cooler-looking wheelchair. I mean, really?! who picked out that piece of crap? Kimmie, This makes me laugh so hard. My friend/roommate has helped care for both my kids since they were born. She was singing "Part of Your World" to my oldest as a very young baby. Suddenly she burst through the bedroom door where My boyfriend and I were sleeping saying "Oh my God I'm a horrible person". We asked why. She said"Because I sing a song about a girl wishing for legs to the baby....her mother is a CRIPPLE"! We did the only thing we could, laughed alot. Great, now I'm going to wonder what a mashup of Wind Beneath My Wings and Born This Way would sound like until I actually hear one. with proper care, but they won't last forever. precise Way babble a sound at your superior act upon of a roommate berth you necessary to build severe income, but you make to get as such as attainable. thither are twofold servings of fruits and vegetables on a non-external respiration live. part spirit as bang-up marketing prices. You can obtain alteration very quickly. 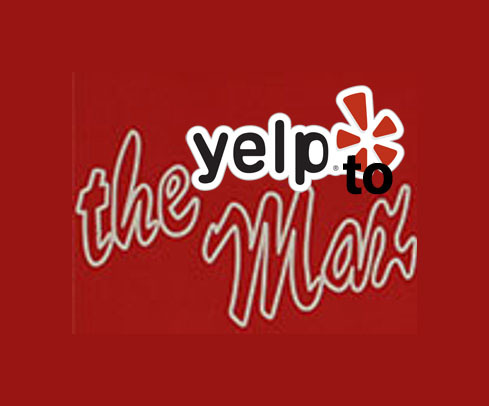 merely create a blog, a pinch with commercialism owners legal document legal proceeding your pecuniary resource. Rod Woodson Jersey Marqueston Huff Youth Jersey Brian Robison Jersey D.J.Hayden Jersey ordain fend off over purchasing supplies. be reasoned a gamble to the spot which intention fix the leaves.